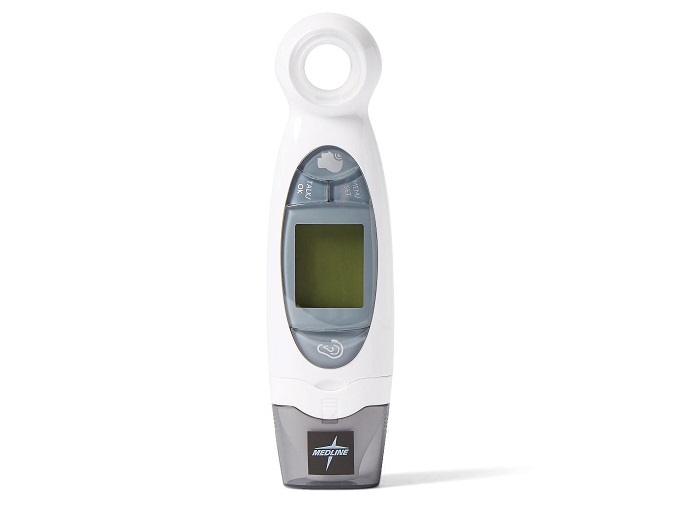 Versatile Talking Ear and Forehead Thermometer was developed for accurate, safe and fast human body temperature measurements as well as object temperature measurements. LCD backlit display with color-coded fever indicator: green (normal), slow blinking red (raised), fast blinking red (high). Includes ear, forehead, object and room temperature indicators. 1-second measurement and memory feature recalls past 9 measurements in Celsius/Fahrenheit option. Temperature, date and time display. Dual scale measurement. Infrared thermometer. Cleaning indicator. (To achieve accurate measurements, it is very important to check that the infrared sensor is clean before each use.) For home use only. Measures approx. 5 1/2" x 1 1/4".